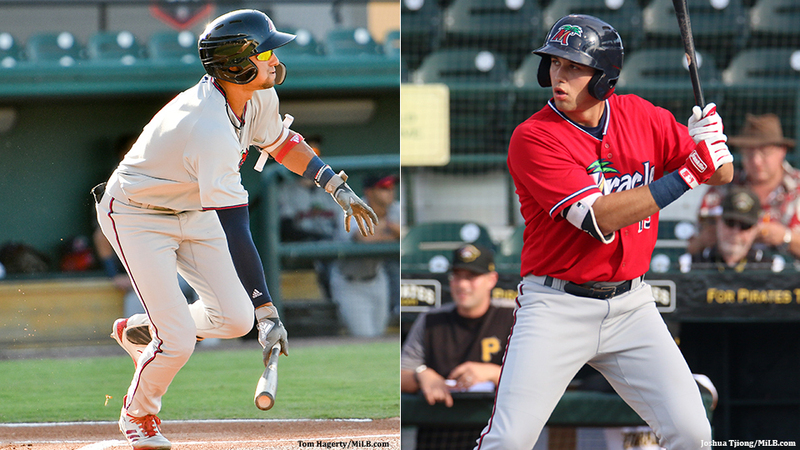 Royce Lewis (l) and Alex Kirilloff were promoted to Class A Advanced Fort Myers after succeeding with Class A Cedar Rapids this year. A new age is on the horizon for the Twins. One year removed from a playoff appearance, Minnesota finished 78-84, 13 games behind Cleveland in the AL Central and 19 games behind Oakland for a Wild Card spot. With the retirement of six-time All-Star and former MVP Joe Mauer, the club will search for the new face of the franchise. Fortunately for the Twins, they have a system with three youngsters among MLB.com's Top 100 Prospects and a rising supporting cast ripe with talent on the mound, at the plate and in the field. Catcher -- Ryan Jeffers, Elizabethton (28 games), Cedar Rapids (36 games): Jeffers was a second-round selection out of UNC-Wilmington in June's Draft and quickly made a strong impression. He hit .422 with a 1.121 OPS and three homers at Rookie-level Elizabethton before being promoted to the Class A Midwest League, where he posted a .288/.361/.446 slash line. "This is a guy we pinpointed for that area of the Draft, so we were lucky to get him," Twins vice president of player personnel Mike Radcliff said. "I don't think we had any preconceived notions that he was going to roll up a level [to Cedar Rapids]. When a guy does that well, it was a combination of offense and defense. The offensive numbers obviously stand out there in [Elizabethton]." First baseman -- Zander Wiel, Chattanooga (101 games), Rochester (15 games): The 25-year-old Vanderbilt product had his most consistent season since turning pro in 2015. "Zander deserves all the credit," Radcliff said. "He's such a dedicated, focused, hard-working guy. A lot of these guys on these lists, they stand out because of skills and tools, high ranking, high Draft picks, so on and so forth. This is a guy who worked his way to where he's at." Wiel never hit higher than .259 in his first three Minor League seasons, but he batted .311 with seven homers and 58 RBIs for Chattanooga this year. That earned him a promotion to Triple-A Rochester, where he struggled in a small sample size (.196 average in 51 at-bats). His power numbers slightly dipped -- he 10 homers compared to 13 last year -- but he finished with a career-high .367 on-base percentage. "He wanted to be a better contact, better for-average, better on-base guy," Radcliff said. "So he made adjustments and did a lot of things to promote that. He also had some issues with his hand, which limited his ability to drive the ball." Second baseman -- Michael Helman, Elizabethton (12 games), Cedar Rapids (27 games): Helman appeared in 39 games across two levels after the Twins selected him in the 11th round of June's Draft, and he made the most of his first taste of pro ball. The Texas A&M product batted .361 with four homers and 15 RBIs between the Appalachian League and the Midwest League. Third baseman -- Jose Miranda, Cedar Rapids (104 games), Fort Myers (27 games): Miranda posted a .277/.326/.434 slash line with 13 homers and 72 RBIs with Cedar Rapids before a late-season bump to Fort Myers. The 20-year-old struggled following the promotion. That was to be expected, Radcliff said, since the Twins' 29th-ranked prospect still needs to work on his approach at the dish. But the front office wasn't discouraged by what they saw out of him in the Florida State League. "It doesn't show up in the numbers. There's a small sample size there and it's not real pretty, but we saw him with more pitch recognition, more plate discipline, when he got to that league," Radcliff said. "He'll probably go back there and start there [in 2019]. ... In our mind, he ended the year on a positive note." Shortstop -- Royce Lewis, Cedar Rapids (75 games), Fort Myers (46 games): The 2017 No. 1 overall pick put together an impressive first full season, hitting .315 for the Kernels through July 13. His numbers declined following his promotion to the Miracle, but the system's top prospect is still right on track. "He has met all the expectations we had for him as the No. 1 pick -- a guy that's going to put up numbers but also have an impact on our team and our organization beyond that," Radcliff said. "Royce is going to be a young Major League player. His arc has not flattened in our outlook, and I don't think we're afraid to challenge him at all." The 19-year-old is still growing into his frame (6-foot-2, 188 pounds) and has told management he desires to bulk up to more than 200 pounds by Spring Training. Lewis is still learning shortstop, too, but the way he's handled everything since being drafted has Radcliff and his colleagues very excited about the No. 7 overall prospect. "He's such a dedicated guy, he'll maximize whatever physical ability he has," Radcliff said. "He just has that kind of makeup. He's wired that way. We have a lot on him. We're not just stopping with the fact he's a shortstop. He's going to be a key offensive player. He's going to be a leader. He's going to be the guy that has to handle the clubhouse and in the community. There's a lot on this guy's plate, and so far he's shown every ability in the world to be able to tackle it." Alex Kirilloff , Cedar Rapids (65 games), Fort Myers (65 games): After missing 2017 to rehab from Tommy John surgery, Kirilloff was slated to take things slow. But he had a strong and healthy Spring Training, and the front office stuck its second-ranked prospect in the three-hole at Cedar Rapids. The 21-year-old hit the ground running and didn't look back all year. He batted .333 with a .999 OPS in the Midwest League, clobbering 13 homers and driving in 56 runs. "What he did this year is borderline phenomenal in a lot of people's eyes," Radcliff said. Following a midseason promotion, Kirilloff teed off on FSL pitching. The 2016 first-rounder and No. 10 overall prospect posted a .362 average with the Miracle to hit .348 and plate 101 runs between the two levels, earning Twins Minor League Player of the Year honors. "He missed a year, but he didn't take any time off improving his body," Radcliff said. "He's stronger, more developed, more mature. We were thinking slow movement. All that came together -- he's a fast mover. He went right through two levels and he's primed to go beyond that in 2019." Brent Rooker, Chattanooga (130 games): In 2017 -- the year he was compensatory-round Draft choice out of Mississippi State -- Rooker hit .291 with 18 homers between Elizabethton and Fort Myers. This year, the 24-year-old clubbed 22 jacks and drove in 79 runs, but his batting average dipped to .253. Radcliff isn't sure yet whether Rooker profiles more as a contact hitter or a slugger with a lower average. The Twins also tested him at a few positions to offer more paths to the higher levels of the organization. "He did do some things to try and take advantage of launch angle and counts and so forth," Radcliff said. "We put a lot of pressure on him to try and find a position as well. We worked him at first base and left field. He's reached a level where he's somebody you consider for your 25-man team here in the next year or so." Minnesota's No. 7 prospect posted a .333 on-base percentage and smacked 32 doubles, but he whiffed 150 times in 503 at-bats. Jaylin Davis, Fort Myers (57 games), Chattanooga (63 games): A 24th-round pick in 2015, Davis worked his way to the second-highest rung of the Minor League ladder in the middle of this summer and performed well enough throughout the season to demand a share of the spotlight. The Greensboro, North Carolina, native hit .273 with a .347 OBP over two levels. He belted six homers (and collected 34 RBIs) following his June 22 promotion to the Double-A Southern League, giving him 11 dingers on the year. Davis also amassed a career-best 24 doubles and stole eight bases. Utility -- Taylor Grzelakowski, Fort Myers (95 games): Grzelakowski was signed out of independent ball last year and appeared in 12 Rookie-level Gulf Coast League games over the end of August and beginning of September. Getting into affiliated action out of the complex for the first time, the Madonna University product batted .298/.370/.458 for the Miracle. "That might be only the second most impressive thing," Radcliff said. "He developed as a leader. He was a guy the rest of the team really looked up to. The way he goes about his business, he's another hard-working guy. He leads by example. He's got a good presence about him." The Twins are attempting to convert the outfielder to catcher, which will ultimately dictate his playing time and advancement. "He has bat strength and bat presence. He handles home plate really well," Radcliff said. "His future depends on where he ends up, what he can do with the glove -- first, in left, whether he can make that conversion to catcher." Right-handed starter -- Tyler Wells Fort Myers (16 starts), Chattanooga (Six games, five starts): The first thing anybody notices about Wells is his towering 6-foot-8 frame, but his size actually held him back until this year, Radcliff said. "He was 6-8 and way, way too big," he said. "He was not in good shape, overweight, and he attacked that. Before , he came in in a completely different physical state, which allowed him to have more durability, more resiliency, a better chance to adjust, develop and project his pitches." Listed at 265 pounds, the 24-year-old went 8-4 with a 2.80 ERA in 16 starts with Fort Myers. Over 32 2/3 innings in Double-A, Wells posted a 1.65 ERA and fanned 39 batters. "He's always had that focus, makeup-wise, but his body didn't allow it," Radcliff said. "Now he's in way better shape to take the instruction and the things he's got to do to move it forward. We have a lot of hope for him, especially now that he has a body that allows for innings to be piled on, more durability. We see him as one of the guys who can be a starter. It's one of the hardest things to develop in the system. This is a guy who looks like he has all the traits to be able to do that." Left-handed starter -- Stephen Gonsalves, Chattanooga (four starts), Rochester (19 games, 18 starts), Minnesota (seven games, four starts): With the Hot Stove bound to heat up soon, the Twins will likely look to free agency or the trade market to shore up the back end of the big league rotation. But as the staff is presently constituted, Gonsalves is certainly an option to hold down a spot, especially since his strong 2018 earned him a promotion to the Majors at the end of the season. The Twins' fifth-ranked prospect began the year in Double-A after struggling in Spring Training, which perplexed Radcliff and the rest of the organization. "He made some tweaks over the winter on how he trained and what he wanted to do with his arm," Radcliff said. "He came to Spring Training and he wasn't very good. He wasn't throwing it hard. He wasn't throwing it over. It was not good. That was addressed at the end of Spring Training and he went forward and got back to his old ways." Gonsalves went 12-3 with a 2.76 ERA in 120 2/3 innings across the Minors' two highest levels. With the big league club, he tossed 24 2/3 frames and surrendered 18 earned runs with 16 punchouts. Relief pitcher -- Andrew Vasquez, Fort Myers (19 games), Chattanooga (17 games), Rochester (four games), Minnesota (nine games): Four levels in one year? "Don't make us too smart on that one," Radcliff said. "He's got a breaking ball that nobody can hit. We just kept rolling him up and nobody could hit it." Radcliff won't label the "breaking ball" as either a curveball or slider, insisting that it's a combination of both -- the velocity of a slider and the break of a curve. The pitch isn't necessarily lethal to the naked eye, but the numbers insist that it is effective. "He's just a reliever, but in the big leagues, it isn't just being a reliever anymore," Radcliff said. "The relief staff has such great value. He's got a pitch that allows him to fit on a Major League team. He's just got to improve a few other things for that to be the case." Over 69 1/3 innings in the Minors, he turned in a 1.30 ERA and a 1.02 WHIP. In five innings with the Twins, he allowed four runs -- three earned.